Are you ready to provide customers with additional services? Learn how to motivate clients to spend more and increase the avarage order value with the Extra Fee extension. Want to extend store functionality with additional paid services and add extra fee options to your website? With the Magento Extra Fee extension you can create an unlimited number of fees for any service you need. Add Magento extra fee to checkout or cart pages to make customers select necessary services with the corresponding tax before completing the purchase. Set specific fee options as default and choose whether to create percent or fixed fee price. The module also allows generating Magento extra fees based on payment and shipping methods. The Magento custom fee module offers two pricing types - fixed and percent. It means that you can either specify a flat amount tax like $10 or set a percent fee like 3% from the cart subtotal. While creating options for a fee block you can specify which of the options will be chosen as default. In this case the Magento payment fee will be automatically applied unless a customer selects another option. Generate Magento payment fees based on various conditions and condition combinations. Use cart and product attributes to adjust fees display to your needs. Therefore, with the extension you can charge special tax for particular items or products from a specific category etc. The Extra Fee Magento extension enables you to choose specific customer groups for which the additional taxes will be available, so that you can easily display particular fees for one groups and hide them from others. If you are running a multi store website, with the Magento custom fee module you can easily translate the fee name and options for each particular store view. You can also specify different labels for different store views. Due to feature-rich Magento extra fee tool you can create and assign fees to any shipping or payment method you need. For example, surcharge 2% for DHL Ground shipping method or add an extra fee for those who choose PayPal. Now it is possible to apply specific fees automatically. 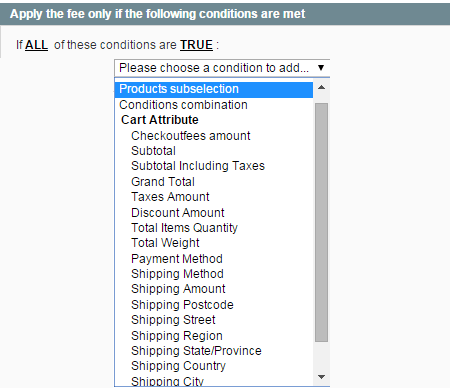 To do that you need to create a fee, preset it’s conditions and enable ‘Autoapply’ option in the ‘General’ tab. This feature allows you to calculate fees using an advanced formula. The module will automatically totalize shipping and tax and subtract a discount amount to display the final fee to a customer. It’s possible to apply the option to all fees by default or set other parameters of calculation for a particular rule. 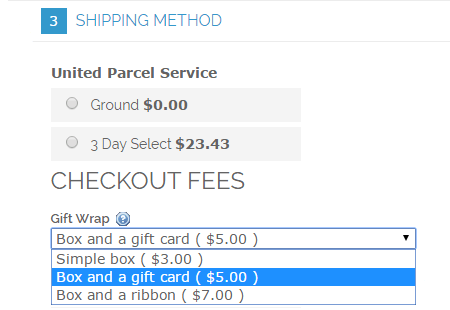 When placing Magento multi fees block on the checkout page you can choose whether to place it on the payment or shipping step. The module enables you to place Magento multiple fees blocks on cart and checkout pages and let store visitors easily select and apply the necessary option to see the final sum including extra fees. The fees can be chosen automatically or can be manually selected by customers. really great! Solves all my business needs. I offer some custom services and now can easily add fees for them. It was quite hard with native Magento custom options. Was pleasantly surprised - the extension appeared to be very easy to navigate. I'll highly appreciate if you add the possibility to upload special logo for each fees block - this will make them more catchy and clear. But the extension itself is really nice and works like a charm. Well done! – New: added a setting to display fee including or excluding tax. – Fixed wrong percentage calculation for some cases.